An Ancient Greek lead bucranium, i.e. an artifact depicting an ox skull, from the 5th century BC has been discovered by Bulgarian archaeologists during excavations in the Black Sea resort town of Sozopol, the descendant of Ancient Greek colony Apollonia Pontica. Bucrania were a common form of decoration in architecture as well as amulets in the form of an ox head. The usage of the ox head motif emerged in Ancient Greece in the 5th century BC, and was also adopted by the Ancient Thracians. 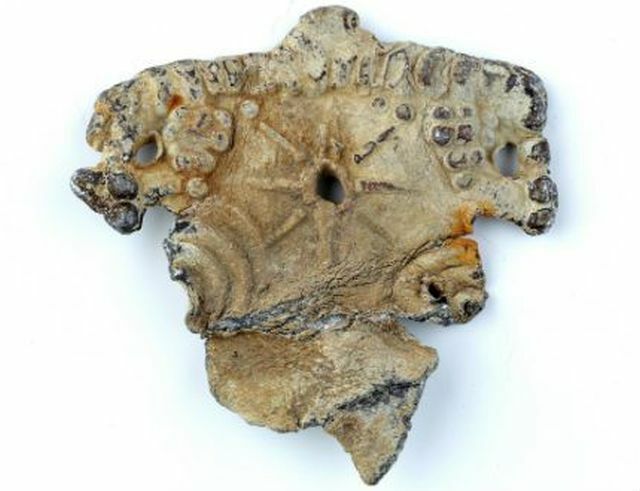 The bucranium amulet discovered in the Black Sea resort town of Sozopol, however, stands out because the ox’s head bears a solar symbol in the form of an eight-pointed star, Bulgaria’s National Museum of History has announced. The eight-pointed star found in Sozopol appears similar to the so called Vergina Sun but predates it by a century. The Vergina Sun is the 16-pointed star discovered on a golden larnax in the 4th century BC tomb of a ruler of the Ancient Greek Kingdom of Macedon, who is either Philip II (r. 359-336 AD), or his son, Philip III Arrhidaeus (r. 323-317 AD), the half of brother of Alexander the Great (r. 336-323 AD); the tomb is located in the town of Vergina in today’s Northern Greece. The announcement of Bulgaria’s National Museum of History says a connection between the bucranium amulet found in Sozopol and the Vergina Sun is possible since Macedon King Philip II is known to have had good relations with the Greek polis of Apollonia Pontica on the Western Black Sea coast, and to have visited it. At one point Apollonia Pontica is said to have even served as a mediator in Philip II’s conflict with the Scythian King Ateas (ca. 429-339 BC). The history of the resort town of Sozopol (Apollonia Pontica, Sozopolis) on Bulgaria’s Southern Black Sea coast started during the Early Bronze Age, in the 5th millennium BC, as testified by the discoveries of artifacts found in underwater archaeological research, such as dwellings, tools, pottery, and anchors. In the 2nd-1st millennium BC, the area was settled by the Ancient Thracian tribe Scyrmiades who were experienced miners trading with the entire Hellenic world. An Ancient Greek colony was founded there in 620 BC by Greek colonists from Miletus on Anatolia’s Aegean coast. The colony was first called Anthea but was later renamed to Apollonia in favor of Ancient Greek god Apollo, a patron of the setters who founded the town. It became known as Apollonia Pontica (i.e. of the Black Sea). Since the Late Antiquity, the Black Sea town has also been called Sozopolis. The Greek colony of Apollonia Pontica emerged as a major commercial and shipping center, especially after the 5th century AD when it became allied with the Odrysian Kingdom, the most powerful state of the Ancient Thracians. As of the end of the 6th century BC, Apollonia Pontica started minting its own coins, with the anchor appearing on them as the symbol of the polis. Apollonia became engaged in a legendary rivalry with another Ancient Greek colony, Mesembria, today’s Bulgarian resort town of Nessebar, which was founded north of the Bay of Burgas in the 6th century BC by settlers from Megara, a Greek polis located in West Attica. According to some historical accounts, in order to counter Mesembria’s growth, Apollonia Pontica founded its own colony, Anchialos, today’s Pomorie (though other historical sources do not support this sequence of events), which is located right to the south of Mesembria. Apollonia managed to preserve its independence during the military campaigns of the Ancient Greek kingdom of Macedon under Philip II (r. 359-336 BC), and his son Alexander the Great (r. 336-323 BC). Apollonia, today’s Sozopol, is known to have had a large temple of Greek god Apollo (possibly located on the Sts. Quiricus and Julietta Island, also known as the St. Cyricus Island), with a 12-meter statue of Apollo created by Calamis, a 5th century BC sculptor from Ancient Athens. In 72 BC, Apollonia Pontica was conquered by Roman general Lucullus who took the Apollo statue to Rome and placed it on the Capitoline Hill. After the adoption of Christianity as the official religion in the Roman Empire, the statue was destroyed. In the Late Antiquity, Apollonia, also called Sozopolis lost some of its regional center positions to Anchialos, and the nearby Roman colony Deultum (Colonia Flavia Pacis Deultensium). After the division of the Roman Empire into a Western Roman Empire and Eastern Roman Empire (today known as Byzantium) in 395 AD, Apollonia / Sozopolis became part of the latter. Its Late Antiquity fortress walls were built during the reign of Byzantine Emperor Anasthasius (r. 491-518 AD), and the city became a major fortress on the Via Pontica road along the Black Sea coast protecting the European hinterland of Constantinople. In 812 AD, Sozopol was first conquered for Bulgaria by Khan (or Kanas) Krum, ruler of the First Bulgarian Empire (632/680-1018 AD) in 803-814 AD. In the following centuries of medieval wars between the Bulgarian Empire and the Byzantine Empire, Sozopol changed hands numerous times. The last time it was conquered by the Second Bulgarian Empire (1185-1396 AD) was during the reign of Bulgarian Tsar Todor (Teodor) Svetoslav Terter (r. 1300-1322 AD). However, in 1366 AD, during the reign of Bulgarian Tsar Ivan Alexander (r. 1331-1371 AD), Sozopol was conquered by Amadeus IV, Count of Savoy from 1343 to 1383 AD, who sold it to Byzantium. During the period of the invasion of the Ottoman Turks at the end of the 14th century and the beginning of the 15th century AD, Sozopol was one of the last free cities in Southeast Europe. It was conquered by the Ottomans in the spring of 1453 AD, two months before the conquest of Constantinople despite the help of naval forces from Venice and Genoa. In the Late Antiquity and the Middle Ages, Sozopol was a major center of (Early) Christianity with a number of large monasteries such as the St. John the Baptist Monastery on St. Ivan Island off the Sozopol coast where in 2010 Bulgarian archaeologist Prof. Kazimir Popkonstantinov made a major discovery by finding relics of St. John the Baptist; the St. Apostles Monastery; the St. Nikolay (St. Nikolaos or St. Nicholas) the Wonderworker Monastery; the Sts. Quriaqos and Julietta Monastery on the St. Cyricus (St. Kirik) Island, the Holy Mother of God Monastery, the St. Anastasia Monastery. During the Ottoman period Sozopol was often raided by Cossack pirates. In 1629, all Christian monasteries and churches in the city were burned down by the Ottoman Turks leading it to lose its regional role. In the Russian-Turkish War of 1828-1829, Sozopol was conquered by the navy of the Russian Empire, and was turned into a temporary military base. After Bulgaria’s National Liberation from the Ottoman Empire in 1878, Sozopol remained a major fishing center. As a result of intergovernmental agreements for exchange of population in the 1920s between the Tsardom of Bulgaria and the Kingdom of Greece, most of the ethnic Greeks still remaining in Sozopol moved to Greece, and were replaced by ethnic Bulgarians from the Bulgarian-populated regions of Northern Greece. The modern era archaeological excavations of Sozopol were started in 1904 by French archaeologists who later took their finds to The Louvre Museum in Paris, including ancient vases from the beginning of the 2nd millennium BC, the golden laurel wreath of an Ancient Thracian ruler, and a woman’s statue from the 3rd century BC. Important archaeological excavations of Sozopol were carried out between 1946 and 1949 by Bulgarian archaeologist Ivan Venedikov. The most recent excavations of Sozopol’s Old Town started in 2010. In 2011-2012, Bulgarian archaeologists Tsonya Drazheva and Dimitar Nedev discovered a one-apse church, a basilica, and an Early Christian necropolis. Since 2012, the excavations of Sozopol have been carried out together with French archaeologists. In 2010, during excavations of the ancient monastery on the St. Ivan (St. John) Island in the Black Sea, off the coast of Bulgaria’s Sozopol, Bulgarian archaeologist Prof. Kazimir Popkonstantinov discovered a reliquary containing relics of St. John the Baptist. In 1974, the Bulgarian government set up the Old Sozopol Archaeological and Architectural Preserve.